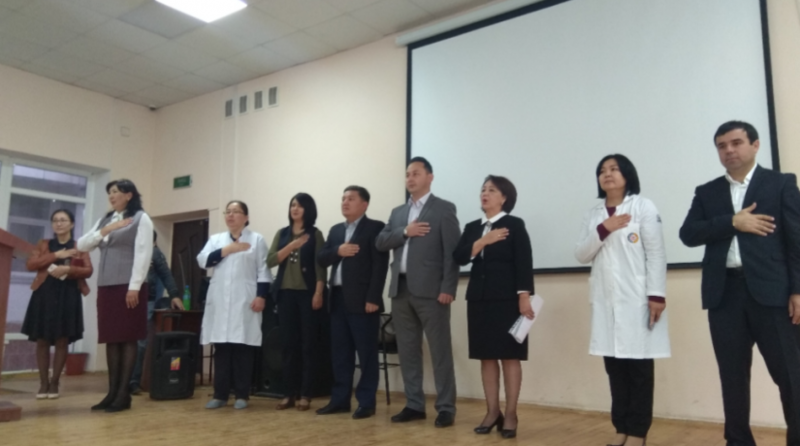 At the international medical faculty Osh State University, the state attestation commission for students of the 6-year course began, the examination began with the anthem of the Kyrgyz Republic. Dean of the International Medical Faculty, Acting Professor Muratov Zh.K. Chairman of Shermatova NK, expert Abdyrakhmanov B., and examiners K. Mumarinov, F. Muydinov, N. Karimova, R. Salirova, A. Omurzakova presented the composition of the commission to the students. The complex examination consists of three stages: is held in the medical clinic of Osh State University, students show good satisfactory knowledge. II-stage will be testing the form of computer testing at the Computer Testing Center No. 4 of the OSHU. Stage III is the solution of clinical problems. The exam began on time with the participation of the dispatcher of the department of Osh City State University, O. S. Stands for graduates were drawn up protocols. All were prepared during the week, lectures on clinical disciplines were conducted. We wish good luck to our graduates.